Back when I was a student at Harvard Law School, I did some research on race and gender ratios of the students of the law school. This involved me painstakingly viewing every name and picture in every yearbook between 1967 and 2009, and counting students by race and gender. I then tabulated the numbers to determine the female/male ratio for different groups. Surprisingly and inexplicably, in 1990 the female-to-male ratio sharply doubles for minorities but stagnates otherwise. 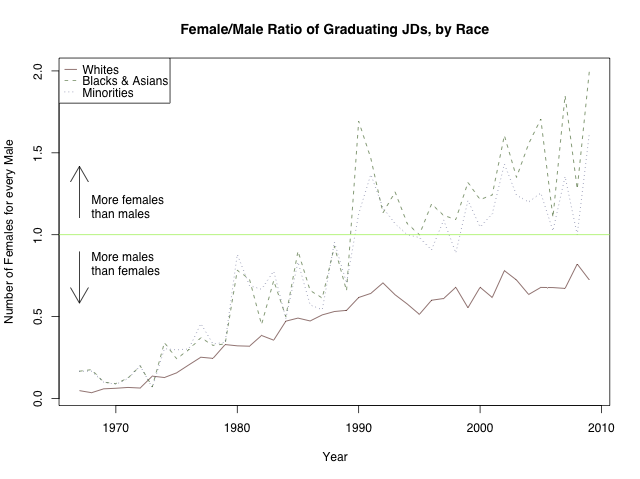 Prior to 1990, Harvard Law School was admitting about the same number of women per admitted man, regardless of race. But starting in 1990, the law school was enrolling more minority women than minority men, yet fewer white women than white men. What happened in 1990? Was it something specific to Harvard, or a widespread phenomenon, or just a statistical fluke? These are questions I hoped to answer, but neither the time nor the resources came up. But perhaps there is someone more enterprising than me who will want to continue this research. To that end, I am making all of my remaining files available for use. This includes several programs that I wrote to aggregate the data and generate graphs. If you do decide to take on this project or otherwise use this data, please let me know, as I would love to know that it has been helpful to someone.